Have you ever gazed up at the night sky and been mesmerised by its inky blackness? Ever marvelled at the luminous stars and swirling burst of brilliants blues, reds and purples? Did you ever wish you could create artwork that would capture these amazing colours and effects so that you could enjoy them all the time? With Paint Your Own Galaxy Rocks, you’ll learn how to create these amazing colour combinations and effects in artworks which can fit into your pocket. 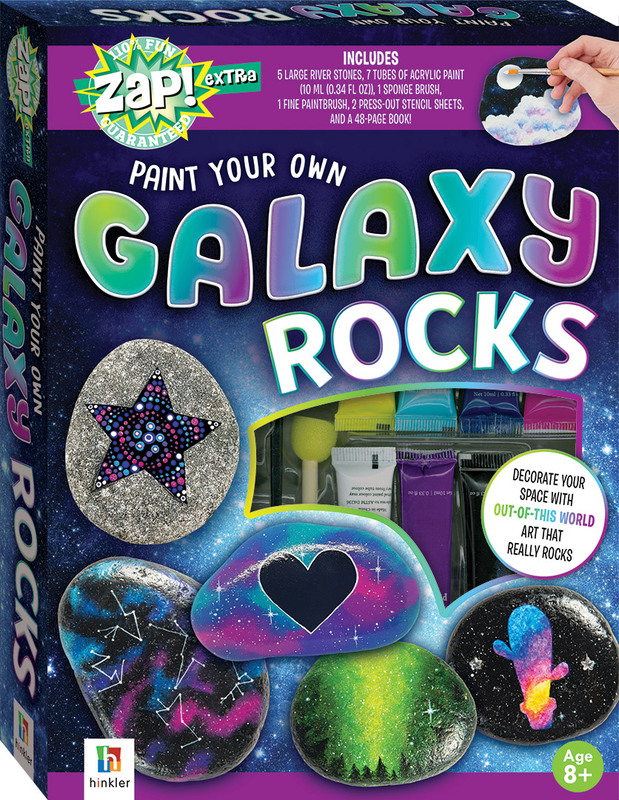 The rocks allow you to create your own mini galaxy domes! This kit contains everything that you need to create gorgeous galaxies, marvellous milky ways and stunning solar systems! Not to mention cosmic dragon eggs, eerie forest scapes and cool galaxy-watercolour cactuses. It contains nine step-by-step, easy-to-follow projects, two stencil-template pages and all the tools that you need to get started on making your own universe.